Kazakhstan gains revenge over Gilas with massive win – SAMAHANG BASKETBOL NG PILIPINAS INC.
Coach Renatas Kurilionokas wasn’t kidding. When he promised a different game from Kazakhstan against the Philippines at the Mall of Asia, Friday night, December 30, he proved that he was a seer when the Snow Leopards upset the home side, 92-88, in the fifth window of the Asian Qualifiers for the 2019 Fiba World Cup at the MOA Arena. When Kazakhstan flew into Manila, the 96-59 loss to the Philippines during the Asian Games was firmly in his mind. But revenge was also in his plans. “You saw the result, right?” said the Lithuanian coach of Kazakhstan. All game long, the Kazakhs kept the Philippines off balanced with their quickness and outside shooting. They shot 52% from three-point territory (12-23) and shot more free throws (24-34 as opposed to Gilas Pilipinas’ 10-15 from the stripe. While their three-point shooting was on target, the Kazakhs also turned to a weapon more commonly associated with the Philippines – their quickness. The Philippines actually outscored Kazakhstan inside the paint, 50-28; scored more turnover points 32-22; had more second chance points, 18-8; and fastbreak points, 11-10. But the free throws and three-pointers hurt the Philippines. In a battle of attrition that saw 12 deadlocks and 29 lead changes, Kazakhstan proved stronger in the last two minutes. Nikolay Bazhin scored four points. Then Anton Bykov added two free throws for an 88-85 lead with 50 seconds left. Yergali added two more free throws after a Marcio Lassiter foul to stretch to five, 90-85. 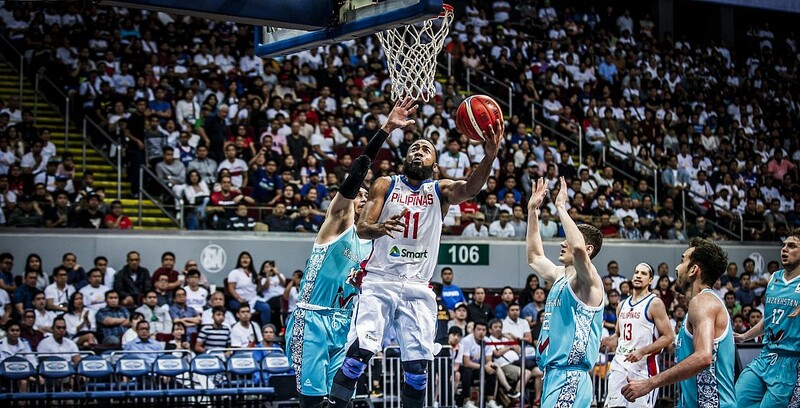 Lassiter knocked down a triple to slice the deficit to two but a defensive switch found Bykov alone for a layup for the finals points as Gilas muffed a last gasp triple attempt. The win was also a personal redemption for Kazakhstan’s Aleksandr Zhigulin who competed during the 2013 Fiba Asia Championships where the Philippines whipped the Snow Leopards, 88-58, in the quarterfinals. Zhigulin, then a newbie to national team play, scored a measly three points in that beating. In contrast, the Philippines’ Stanley Pringle dazzled the crowd with his sidesteps and crossovers for 29 points. “We didn’t get enough stops,” succinctly put Pringle who will sit out the Philippines’ match versus Iran on Monday, December 3 in favor of Christian Standhardinger. Also getting the nod for that crucial match are Jayson Castro and Troy Rosario who will have served the last of their suspensions owing to their part in the brawl with Australia last July 2. With Japan defeating Qatar, 85-47; they are now tied with the Philippines at 5-4, although the latter is still at third owing to a quotient system. However, the match versus Iran this Monday takes on a greater urgency. “We will just have to put this behind us and get ready,” summed up Guiao. Kazakhstan 92 – Zhigulin 30, Bykov 20, Murzagaliyev 11, Yergali 10, Bazhin 9, Kuanov 8, Marchuk 4, Chsherbak 0, Lapchenko 0, Gavrilov 0.